For well over 30 years, Ken Brader and his holiday brass have entertained audiences throughout the Lehigh Valley area. Holiday shoppers at our various performance locations have been treated with a little extra holiday cheer as they make their way through the malls. As the member with the longest tenure in the ensemble, it has been a great pleasure to share this wonderful music with so many. Due to the many logistical issues that arise when trying to schedule performances, the group only performs during the Christmas Season. Because of such a limited schedule, it seems like there is always a lot of anticipation to play, but, once it arrives, is over so fast and we are left with anticipating the next year. Since its inception, the membership of the ensemble has certainly grown. In fact, over the past several years the range of members has been anywhere from 35-50. But, with scheduling being a constant issue, it can be difficult to get everyone to play from year to year. While everyone raves at the glorious sound created by the trumpets, flugel horns, baritone horns, trombones, and tuba, the entire show lasts only about 20 minutes. It always leaves the audience wanting more. After this past show schedule in December, another longtime member, Jeff Vacha, suggested to me that we create a professional recording of the group and make a CD. We have no really good recording except those taken from a mall performance. But, as you can expect, there is always extraneous talking and noise from the mall which gets captured on the recording. I brought the idea to Ken and the group and it was met with a great deal of enthusiasm and excitement. We would finally be able to take this great sound into the studio and record a clean wonderful sounding CD of our music. 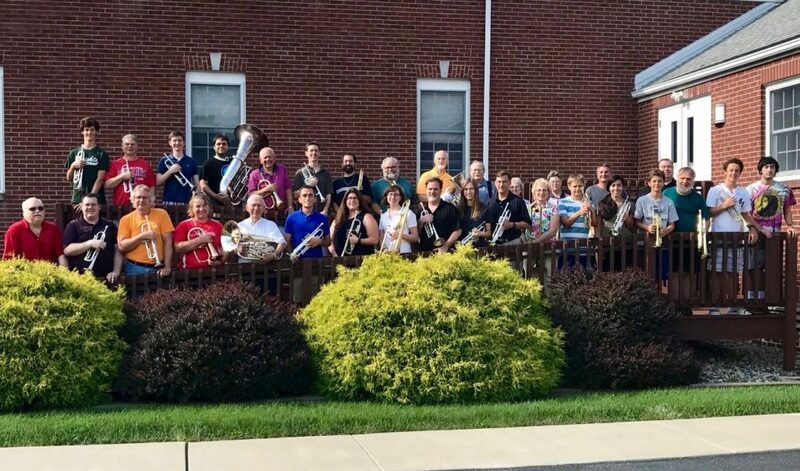 We settled on Saturday, July 15th and scheduled the session in the Bethel Memorial Baptist Church in Easton, Pa. We worked with D Freeman, engineer and owner of Sonlight Productions in Perkasie, Pa. Their website is www.sonlightproductions.net. D is a consummate professional and was extremely great to work with. He understood our needs and desires and made sure we were happy. One of our members, Rachel Ewaniuk, works with D on projects and recordings so it was good to have a member who knows our music to play a key role in the recording. It needs to be stated that the cost of the recording was generously donated by D and his studio. We are so very thankful to D and everyone at Sonlight Productions for donating their time and service to our project. We could not have done this without your generosity. We were blessed with a great day and everyone was excited to be a part of such a wonderful project. I believe you can never take life for granted. The fact that this group has played for so many years and just now we are able to record it really is proof of how Ken and his music creation has stood the test of time. The initial listen in the headphones really sounded awesome and I cannot wait to share the finished product with you. The joy and camaraderie with everyone in the room was just such a blessing. It was also a great day for Ken as he was also able to hear his music be recorded for the world to hear. Although it took several hours, we are so happy to have a product that will last forever. The goal of the project is not to sell the CD but to give them away. We want to be able to share the joyful music with those who have been longtime supporters or those who are unable anymore to come out to hear our group. Everyone in the ensemble will receive a copy and we will have copies on hand when we perform in December. Stay tuned for more info as I will announce once the final edits have been made and the copies are ready. A HUGE thank you to everyone who participated and sacrificed time on their Saturday to be a part of this!